The ice is now disappearing, slowly drifting and melting away. People from the different setlementens are visiting each other. 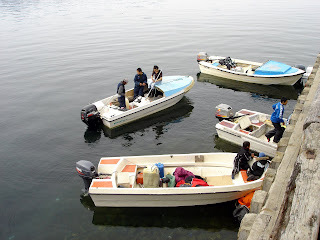 Some boats are comming to get their part of the capelins, in on the usual fishingplaces. Some people from Kuummiut have left their homes in the setlement, to camp in tents far away from Kuummiut. Now they feel free.....No clocks...a lot of fish.....the time is theirs.......Maybe the best days of the year. Most people come back to Kuummiut in July......Bringing sacks of dryed capelins an trouts. Many old stories will be told in the tents, in the light summernights.